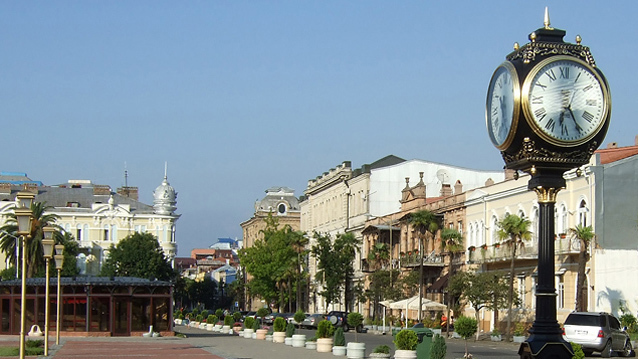 Batumi is a seaside city in a subtropical zone on the Black Sea coast with a population of 122 000. The city is close to the Turkish border. 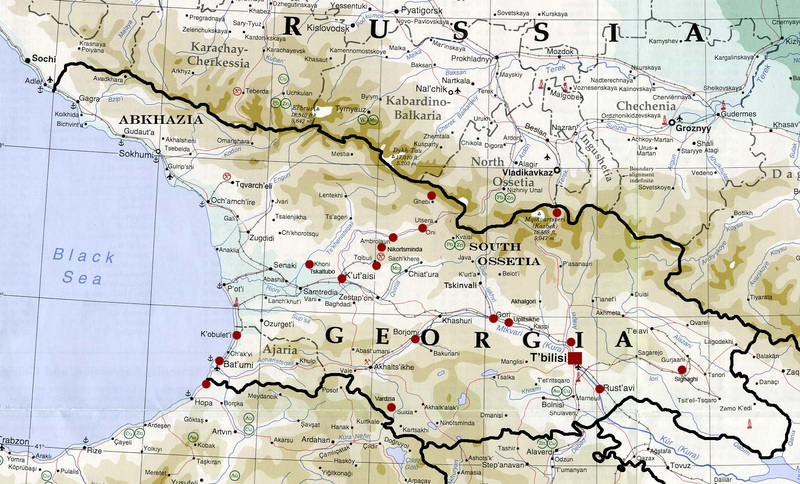 Batumi is the last stop of the Transcaucasian rail-road and the Baku oil pipeline. “Khrushchev apartments”; those horrible monuments over Stalinist functionalism. 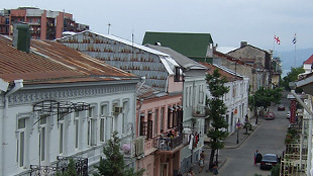 The most natural way to get to Batumi is from Tbilisi. You can either drive by car, which is rather dangerous due to erratic traffic, or you can go by train. Mashrutkas, small buses, is very "Georgian", but only for the sensation seekers among us. I would stick to train if I were you, like Hamsun. The Norwegian novelist Knud Hamsun visited Batumi in 1899 during his eternalized trip in the Caucasus. He was in awe over the modern and lively city. Especially the beach promenade caught his attention. 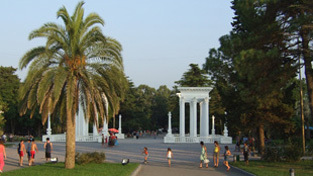 "Batumi has also its promenade. By sunset the beach boulevard swarms of people driving or strolling. Here’s prancing horses, booming silk and parasols, and smiles and greetings just like in a South American city" (Knud Hamsun, 1899, I Æventyrland). The style hasn’t changed much from those days. 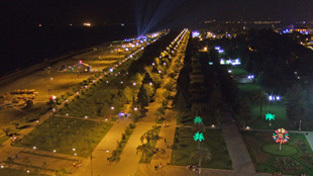 The beach boulevard is every night filled with tourists and locals prancing around showing off, or looking curiously at each other in a relaxed and friendly atmosphere. The straight boulevard is some 3-4 kilometers long, cutting through an area filled with casinos, discotheques and restaurants. A myriad of benches placed along the boulevard come in handy. 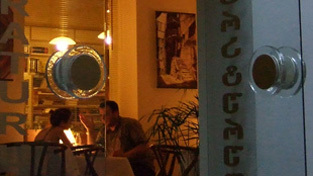 It's a lot to say about the Batumi nightlife, but one word cover most of it: RETRO. You can't avoid listening to "Ma Baker", "Ra, Ra Rasputin" and other painful disco-moments from the early 80's. I really can't imagine how the young ones fall into trance of memories from an era dominated of long curly bleached hair and other major turn-offs. Speaking with locals, I got an understanding that this is some kind of new wave in Eastern European music taste (2007). That is also supported by the retro music presented on the famous and spectacular Jormala-contest in Latvia every summer. But there are other things to be explored at the beach promenade, namely the Devils Wheel. On the beach boulevard there's a huge Ferris-wheel. It rotates slowly, and gives the passengers a fantastic panorama over the beaches and the city. The ride is free, and you must expect to spend some time in a rather slow moving queue. But it is definitely worth the wait. The Georgians call it The Devils Wheel because it’s captivating, scary and you cant resist it. After being tortured with Boney M on the promenade, it is soothing to discover that my dear Grieg's "In Dovregubbens Hall" is played loud nearby. The powerful fountains in the city square have been synchronized to the works of several big classical composers, and the show takes place every night. 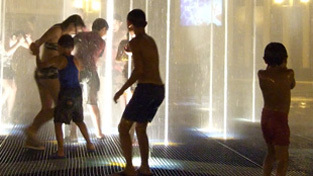 The local population takes an active part of the life in the city, and the fountain is a natural playing ground for the children. The cool kids take off and place their t-shirts on top of a nozzle and watch it fly into the sky when the music starts. 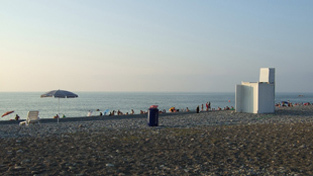 Batumi is a great city for bathing and entertainment. The humidity and temperature was extreme, but manageable. Clean, safe and beautiful in every way Batumi is a must for all visitors to Georgia. The humidity is extreme though. Your clothes feel like they are glued to your body most of the time. Also by night. But in all fairness I should add that I generally prefer the mountain areas with their dry air and cold nights. If I were forced to toss the dices, I’ll give Batumi a good 4, where lack of service combined with rather high prices prevents it from getting a straight 5. View from our apartement. 30 Lari pr.night. The subtropical climate is great for palms. Playing in the fountains accompanied by Edvard Grieg. You find miles of beaches consisting of fine rubbel. The beach boulevard seen from The Devils Wheel.